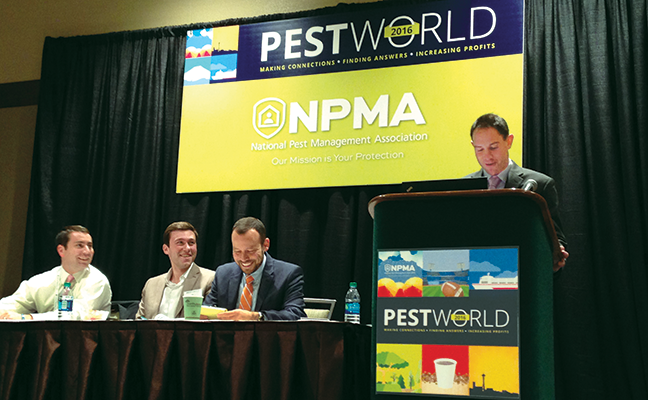 At PestWorld 2016, the National Pest Management Association’s public policy team discussed legislation that had an impact on the industry. Pictured from left are Andrew Bray, Jake Plevelich, Dr. Jim Fredericks and Andy Architect. The National Pest Management Association’s (NPMA’s) public policy team, along with politically active pest management professionals (PMPs), work hard year-round to keep regulations off the books that may have a negative impact on the industry. NPMA staff members Andy Architect, chief industry relations officer; Andrew Bray, director of public policy; Dr. Jim Fredericks, vice president of technical and regulatory affairs (and Pest Management Professional columnist); and Jake Plevelich, public policy coordinator, hosted a session at PestWorld 2016 to update PMPs on public policy developments. Neonicotinoid bills were big in 2016. Lawmakers in 12 states proposed 12 bills. Two passed; they either restrict neonicotinoids or outright ban them, Plevelich said. He added that members of the NPMA’s State Policy Affairs Representative (SPAR) program helped to reform the proposed bills or ensure the bills did not pass. Bed bug bills also were prevalent in 2016. These regulations can be beneficial to PMPs, as they typically require their hiring to remedy a landlord/tenant problem that involves bed bugs. The Zika virus had a major impact on the pest management industry last year. It helped prove to the public that a PMP is someone to turn to during a public health crisis. In early 2016, Architect, Bray and Dr. Fredericks met with various committees on Capitol Hill — some the NPMA doesn’t usually work with — to educate members on the Aedes aegypti mosquito and how PMPs could help. The $1.1 billion appropriations bill Congress passed last year was good news for PMPs. It included funding to help fight the spread of the Zika virus, and these funds can be made available in public/private partnerships. States that don’t have the necessary infrastructure to handle mosquito management can hire a PMP to oversee the work, Bray said. The NPMA’s Structural Fumigation Stewardship initiative was another positive for the pest management industry. After a couple of fumigation-related incidents made the news, the NPMA sought input from PMPs and distributors to craft a comprehensive structural fumigation strategy. The team ran it past the U.S. Environmental Protection Agency (EPA) and the Association of Structural Pest Control Regulatory Officials, and were told it was great. This year, more states will introduce legislation that allows localities to regulate pesticides, Plevelich said. In 41 states, pesticides can be regulated at the state level only; however, that doesn’t stop activists from trying to pass resolutions that will ban their use on city-owned property. In California, a bill that would have banned rodenticide use statewide did not pass, but is expected to come up for vote again. The NPMA is being proactive by building coalitions with the Pest Control Operators of California association and developing talking points, Dr. Fredericks said. Also on tap for 2017 is the EPA review process for several product categories, including pyrethroids, rodenticides, fumigants, fipronil and neonicotinoids. While it’s impossible to predict which pests will be most prevalent in 2017, concerns about the Zika virus will likely linger. The management of ticks that cause Lyme disease and rodent and cockroach control are equally important. Managing Editor Diane Sofranec can be reached at dsofranec@northcoastmedia.net or 216-706-3793. 1 Comment on "Session updates PMPs on public policy developments"
AB 2596 in my view is long overdue, there is plenty of evidence showing just how much of a threat that profligate usage not only to wildlife and environment but also the potential for it to disrupt the food chain too. Marin County have been rodenticide free since 2009, having developed a pest-specific ipm plan which is reported to be yielding great results. id like to see a similar plan for California.